Discover & Find Corporate Email Addresses #1 Tool to discover business email addresses. Search, lookup and find real email addresses from the first and last names, and the company name or website. Give it a try, find an email address now!. Discover email addresses in bulk. Signup Here. It discovers business email addresses from the first and last names, and the company name or website. It uses millions of business email patterns and mail server results to give you industry-leading sending rates. Find real email addresses along with deliverability score that can maximize your campaign response and ensure you reach the right mailboxes and real prospects. Safely import your contacts list for discovery under your account and our system will display the actual cost it will take to run the list. Post payment, the system will append the emails for contact list and present the download link. Using Real-Time API helps to find correct email addresses from entering your systems in the places. Email marked as "Valid" or "Catch All" never bounces? Email discoveries are never 100% accurate, still we can guarantee that more than 95% of deliverable email addresses won't bounce. What does email addresses marked as "Risky" means? If our system detects that although, email seems valid but there are chances that it's not read by anyone. 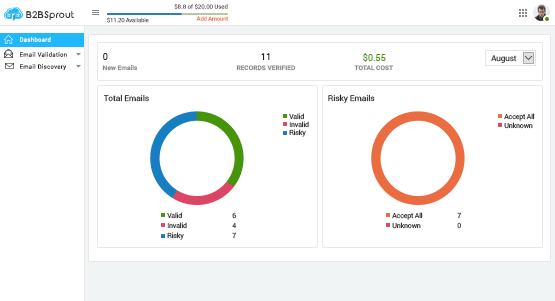 The system automatically marks such emails as "Risky". There are high chances that it has no recipient. Do you send an email to the email address for verification? No, Email validation system goes through various steps to ensure that requested email address really exists but we never send an actual emails. 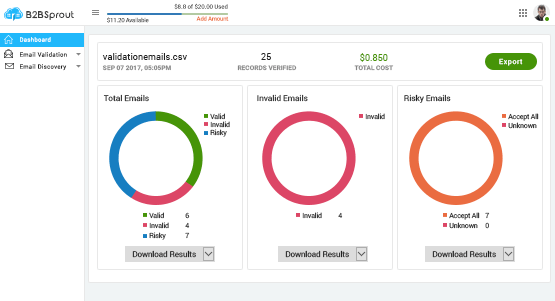 How do you count email discovery requests? Each discovery is counted as one request. Free accounts are limited to use 10 requests a day. Please add credit to your account to find more email addresses. What about security of my email lists? Security is our top priority, we never share/reveal email addresses of your email lists with anyone EVER! What should be my input for finding real emails? Upload a CSV file with the first name, last name, and company name that's enough for us to discover the prospect. In return you will get CSV with real email addresses.